Is ESI Medical licensed by the state of New Jersey as a Health Care Services Firm? YES, ESI Medical is licensed as a Health Care Services Firm, meeting the state's requirements for home health care agencies and is regulated by the stateâ€™s Division of Consumer Affairs and Board of Nursing. What is the difference between skilled home care and private duty services? Skilled home health care can be provided for those who have a medical condition that will be helped by the skill of a nurse, physical, speech or occupational therapist. Private duty care is also known as personal care. In this case, the person often needs a home health aide to help with bathing, dressing or meal preparation. Do you offer Hourly, Overnight and or 24 hour a day/Live-In service packages? Upon agreeing to terms, you will be asked to sign a Home care Agreement outlining payment terms and estimated costs. You can cancel services at any time. Do you have a weekly hourly minimum? For continuity of care, it is much easier to schedule an employee for steady days and times. We have a two hour minimum per day, and a 10 hour minimum per week. We accept private payment, and most long term care insurance policies. We are also able to work with most insurance companies. Do you do criminal background checks on all of your employees? YES, all applicants are put through a state and federal background check. Are your employees bonded and covered by Professional Liability insurance? YES, all of our employees are individually insured through our Professional Liability insurance policy and are fully bonded for your peace of mind and protection. Do you schedule the same caregiver for each visit? YES, we like to build relationships and continuity of care is a very important aspect to doing just that. YES, at any time you can request to change your home health aide, or homemaker. I need to know my home health care provider is going to be accessible. What happens if an emergency comes up after normal hours? You can reach our ESI Medical Representatives 24 hours a day/7 days a week. Your call will be answered by an office representative, not an answering service. We also have a trained supervisor and Registered Nurse on-call 24 hours a day, 7 days a week including holidays and after hours. What type of information is available to the client and his or her family regarding the care they are receiving? All of our employees are required to follow a nurse's care plan and must formally record their daily activities, a record of which is always left with the client. Your aide will record dates and times of service as well as a description of all services provided. This information is confidential and can only be viewed by the client and or client's family. Are you a locally owned company or part of a franchise or large corporate health care system? ESI Medical is a physician owned home care agency that is locally owned and operated. ESI Medical primarily covers Ocean and Monmouth County, but we have partners that cover the entire state as needed. Vitals.com is a great source for comprehensive medical information on over 720,000 doctors nationwide. It offers consumers free information on doctors' practices and specialties, consumer reviews, recommendations from other doctors as well as free physician profiles. How do I know it's the right time to begin looking for home care care services? This can depend on a variety of factors. Your loved one may be unable to manage routine tasks and may be at great risk when they try. For personal reasons, you may not be able to provide a high level of care for this individual. If you feel overly stressed or physically unable to keep up with the demands for caregiving, you may want to seek advice from a doctor or other health professionals in your community. Sometimes just opening a dialogue with your loved one can be helpful. Now is the best time to begin gathering information and preparing for the future - sometimes the person you care for can help you sort out these critical issues. This may also be the perfect time to look into the status of the individual's health care proxy, will and power of attorney. Are your services available for the elderly in hospitals, nursing homes and or assisted living facilities? YES, we can enter a facility and offer complementary services as well. 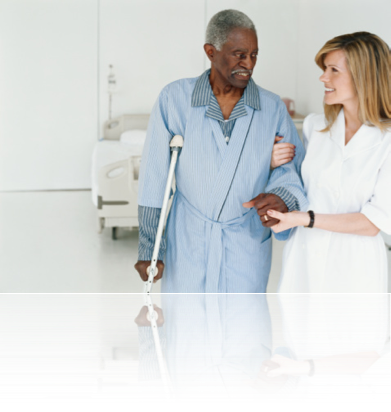 We assist many individuals and couples through their rehabilitation in conjunction with the facility staff. Many families don't realize that they have the right to choose a senior care facility for a loved one in a hospital who needs to be transferred within days. Often the physician and discharge planner will suggest a specific care setting that has availability. But if you have a preference - such as a facility close to you or one that a family member or friend has recommended - you should contact that facility immediately and ask about availability. In addition to this option, you could choose to bring your loved one home with home care. Ask the hospital discharge planner for recommendations on home care providers. This process can also be used in identifying a senior care facility. Knowledge is a valuable asset when you try to plan for the future, especially in light of the fact that costs associated with all forms of health care are on the rise. Individuals and families must educate themselves on the financial realities of senior care services and anticipate the needs of aging. Use the following information to gain a basic understanding of the financial options available to pay for senior care. To find out more, utilize the resources on this web site or consult with your financial advisor or attorney. The senior or his/her family pays for services from personal income, including savings, pensions and other resources. Personal assets are the first consideration when determining ability to pay for senior care services. ESI Medical accepts private payments. Many people mistakenly assume that Medicare will pay for all their senior care. Medicare is a federal health insurance program that provides limited coverage for services provided in nursing facilities and in home care settings. Assisted living is not covered by Medicare. Medicare will cover the first 20 days in a nursing facility that are determined to be medically necessary. The next 80 days require a co-payment. Coverage can end at any time during the stay if the resident does not meet Medicare's strict medical criteria. Medicare does not pay for assisted living and will only pay for extended home health care services if a stringent set of conditions is met. Hospice care services in both a nursing facility and home care setting are covered. Medigap policies and private supplemental insurance will generally pay part or all of the Medicare co-payments. These policies will not pay for extended nursing facility stays. Medigap coverage always ends when Medicare coverage ends. For information on Medicare coverage of long term care services, contact your local Medicare agency or visit the Medicare web site at www.medicare.gov. ESI Medical is not a Medicare approved provider. Medicaid is a federal, state and locally financed program that pays health care expenses for those who qualify financially and medically. It is very common for residents in nursing facilities and those receiving home health care services to turn to Medicaid because they have spent down, or exhausted, their assets. Medicaid also covers some home health care services. Medicaid eligibility is determined by both need for service and the applicant's financial resources. Income and resource eligibility guidelines vary based on marital status and other variables. Medicaid will review the income and resources of the applicant and spouse for 60 months to determine if they have made any asset transfers. Hospice services, in both a nursing facility and home care setting, are covered as long as Medicaid is the only insurance. Individuals may contact their county department of social services for more information on eligibility for Medicaid, or call the social work department at any facility listed on this web site. ESI Medical is not a Medicaid provider. Administered through the Social Security Administration, this program supplements payments for adult care facilities and housing for individuals with low incomes. Like Medicaid, financial qualification is necessary for this program. Individuals can be dually eligible for Supplemental Security Income (SSI) and Medicaid (for health care needs), as well as other government assistance programs. Information on applying for SSI is available through your local Social Security office, or through the Social Security web site at www.ssa.gov.